Posted on Monday, October 31st, 2011 at 10:00 am. The Tsunah Foundation has launched its Eleventh International Youth Culture Tour of Taiwan. This program, which is geared toward college students and young professionals, provides a unique and exciting opportunity to learn firsthand about the beautiful island of Taiwan and its people, culture, and history. We hope you will consider enrolling yourself, a friend, or a relative in this wonderful program. The highlights of this year’s program are listed below. 1. The tour runs eleven days and ten nights (12/23/11-1/2/12). 2. 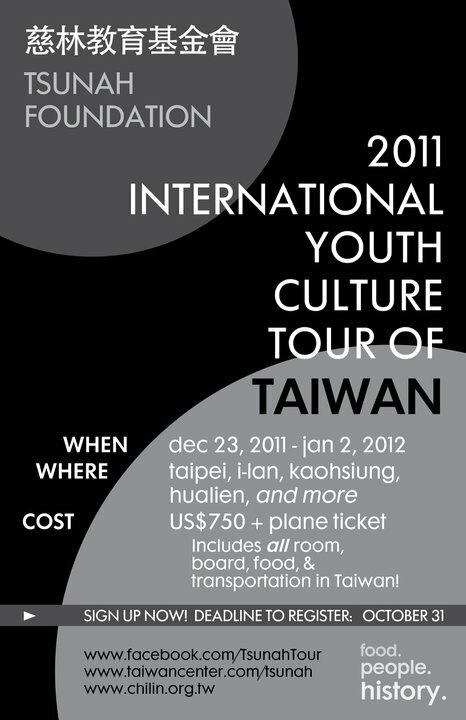 The cost is $750 per person, excluding airfare to and from Taiwan. 3. Participants may apply for a limited number of cash scholarships. The 2011 tour will begin with three days in I-Lan County, with presentations on Taiwanese history and politics, and visits to interesting local sites such as a night market and a traditional arts center. On the fourth day, the group will embark on an island-wide bus tour along Taiwan’s stunning east coast to Taroko National Park, Hualien, and Taitung, before continuing to the vibrant southern cities of Pingtung, Kaohsiung and Tainan, and finally returning to the capital city of Taipei via high-speed rail. The itinerary includes stops at significant sites of historical and cultural interest; formal lectures; video presentations; informal discussions about the history, culture, economics, and politics of Taiwan; and plenty of opportunities for fun and exploration. Please visit the Tsunah Foundation’s web site, www.taiwancenter.com/tsunah or join us on Facebook (search for “Tsunah Tour” or go directly to www.facebook.com/TsunahTour, and click “Like”) for detailed information and updates. The deadline for enrollment is October 31, 2011. However, we strongly recommend that participants register as soon as possible due to limited availability. Please note that you may also want to purchase plane tickets earlier rather than later, since tour dates fall during the peak holiday traveling season and tickets can be increasingly difficult to secure after September.